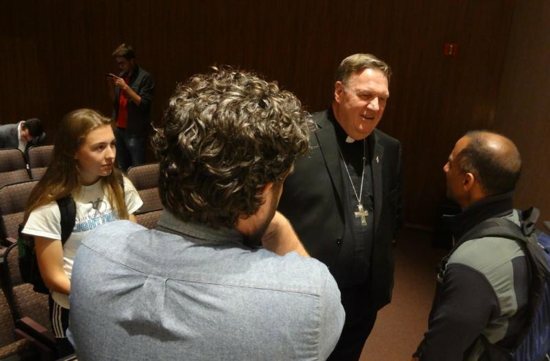 Cardinal Joseph Tobin of Newark, New Jersey, devoted his remarks in the Aug. 30 lecture at the University of Notre Dame to immigration, discussing the impacts of a corrosive political discourse and secularism and drawing on Pope Francis’ teaching on the dangers of societies driven by money and social exclusion. But the question-and-answer period following his remarks focused heavily on the abuse crisis in the church. On both issues, Cardinal Tobin said Catholics are asking how we got to this point. The cardinal cited the 2010 words of the late Cardinal Francis George of Chicago, who said: “For too many, politics is the ultimate horizon of their thinking and acting.” Building on this, Cardinal Tobin said it’s a “first commandment issue” when political agendas occupy a place of importance that belongs to God and the values that flow from our faith. He noted that the bishops, in their “Forming Consciences for Faithful Citizenship” document, have advocated that people’s faith should inform their political views, not the other way around. The cardinal said using Scripture to justify the separation of children from their parents at the border is an example of faith warped by ideology. He also quoted from Pope Francis’ messages to the World Meeting of Popular Movements in 2016 and 2017, where he said “Fear your neighbor” is the new commandment from those who manipulate people’s fear and frustration. Cardinal Tobin said the response of U.S. Catholics opposed to family separations at the border gives him hope that Americans can still have a change of heart on immigration. “We see the ongoing good work of Catholic Charities, the Catholic Legal Immigration Network and other grassroots efforts aimed at accompanying the frankly terrified members of our immigrant communities as they weather the storm,” he said. In the question-and-answer period, the cardinal said he agreed with Pope Francis’ Aug. 20 letter that clericalism is the root cause of the abuse crisis. He said setting clergy apart as an elevated caste was particularly enabling not just to abuse but to the cultures of secrecy and avoiding scandal that lead to cover-up. “The church has been turned upside down,” he said, referring to recent abuse and cover-up scandals. He said he welcomed laypeople demanding a leadership role in their church, something he said reflects the vision of the Second Vatican Council. The cardinal was a presenter at the annual Rev. Bernie Clark, C.S.C. Lecture at Notre Dame, sponsored by the university’s Center for Social Concerns to highlight themes of Catholic social tradition. Clemmer is managing editor of Our Sunday Visitor Newsweekly, a national Catholic newspaper based in Huntington, Indiana.